Brazil is considered one of the world’s most important environmental powers. With a continental territory containing almost 70 per cent of the Amazon rainforest, along with a rich biodiversity and huge amount of natural resources, its geopolitical role in environmental decisions is crucial to ongoing global negotiations surrounding climate change. Development policies based on extraction and exportation of raw materials by the mining and agribusiness sectors threaten the global environmental balance and the long-term sustainability of Brazil’s economy. 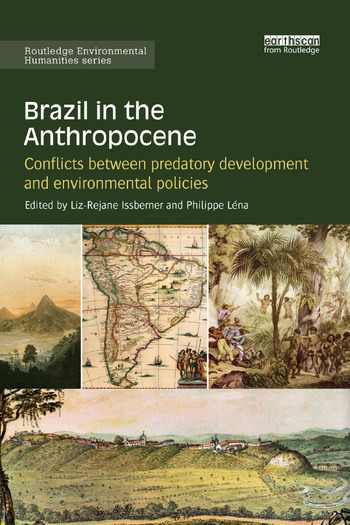 Brazil in the Anthropocene examines Brazil's role within the global ecological crisis and considers how national and international policy is influenced by the interdependence of social, political, ethical, scientific and economic factors in the modern age. With chapters from a diverse range of international scholars this interdisciplinary volume will be of great interest to students and scholars of environmental politics, environmental sociology and the environmental humanities. 7 Biosafety regulations and practices and consequences in Brazil: who wants to hide the problems? 13 Financing sustainability: where has all the money gone? Are the multiple social-ecological initiatives the sign of apolitical and cultural shift? Liz-Rejane Issberner, economist, is Senior Researcher at the Brazilian Institute on Information in Science and Technology (IBICT) and Professor at the Post-Graduate Programme in Information Science (IBICT with Federal University of Rio de Janeiro, Brazil). Her interdisciplinary research involves information and political ecology as well as eco-innovations and science, technology and social change. Philippe Léna, geographer and sociologist, is Emeritus Researcher at the Research Institute for Development (IRD-France) and the National Museum of Natural History (MNHN, Paris, France). He has collaborated since 1980 with Brazilian research institutions like INPA (National Institute for Amazonian Research), MPEG (Museum Emílio Goeldi of Pará) and the Federal University of Rio de Janeiro (UFRJ), conducting research on social-ecological issues in Amazonia.